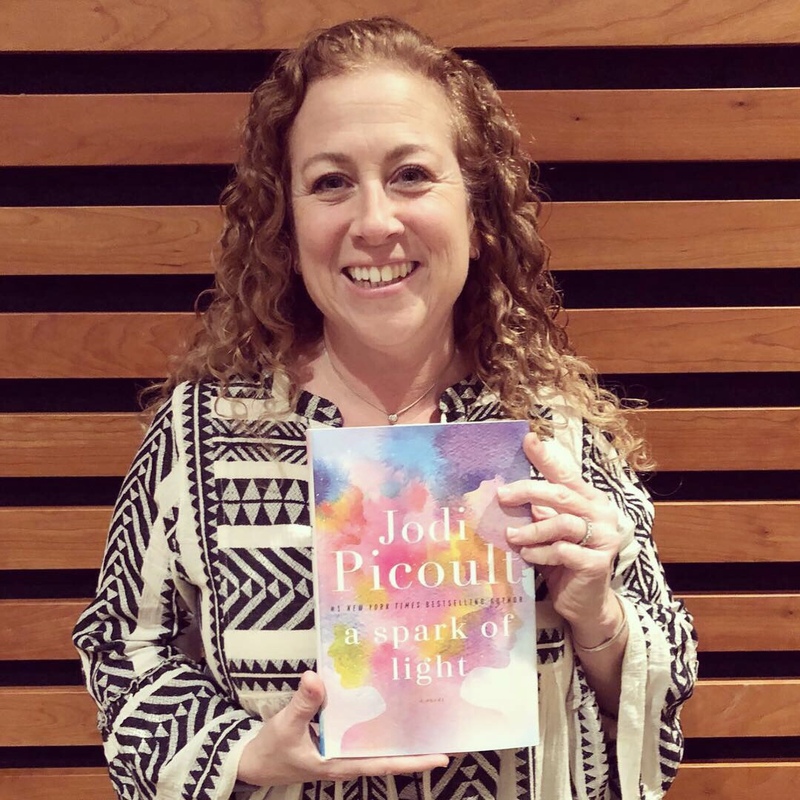 When I heard about Jodi Picoult coming to Toronto to speak about her latest book A Spark of Light, I was interested in attending as I have read a number of her books and enjoyed them. Her event, unfortunately was sold out. 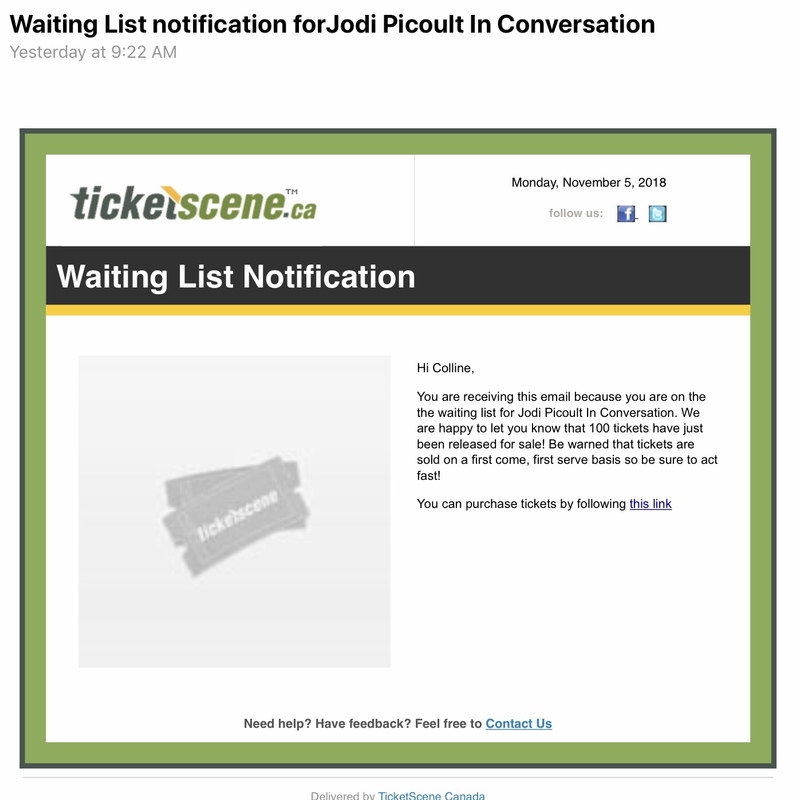 I put myself on the waiting list as someone might cancel their ticket. The event was on Monday and I had swept it out of my mind. When checking my email during lunch, I saw that I had received a notification stating that more spaces had opened up: I quickly messaged my cousin to let him know (he enjoyed her books as well), and bought tickets. Going to the event was a bit rushed as it was last minute but I thought it would be worth it as she is a well-known and successful author. When I arrived at the venue in the evening, I was surprised at how many people were in attendance – over 500! It is the biggest author event that I have been to. I liked that they had large screens to project the conversation to the audience. As a result I did not mind that I was at the back of the hall. It was interesting to listen to someone who has written so many successful novels. She is very confident – and very political. To be honest, I was disappointed that she spoke so much about American politics. The election may have been the following day, but we were there to listen to her speak about her book as well as her writing process. I am still glad I went to the event, however, as what she said will give me a better understanding of the novel when I read it. Have you read any of Jodi Picoult’s novels? No, it brought negative memories. I have not read enough of her work, which is funny since I think we have every one of her books in the house… I used to think of her as a “local author” knowing that she was New Hampshire based and not realizing that she was as widely known. Or as huge. Glad that you got a chance to see her talk! Sorry it was bad timing for you – I’m sure the elections was the biggest thing on her mind! That is true – which is why I think she spoke about it so much. Maybe one day you will pick up one of her novels. The current one focuses on abortion so it may not be the one for you. The books of hers which I have read have been worthwhile, but I haven’t read any of hers in a few years. 500 people is a lot! I was surprised by the number of people there too. She is definitely a popular author. I can understand completely Yvette – especially if it is everywhere you look. Fiction doesn’t have to be totally realistic – just believable and when reading her books I have believed. When I read her latest, though, I will have a more critical eye – and I will have someone to speak with whom to discuss the book – my cousin who came to the event with me. I’d be interested to hear whether you both agree about her latest book. 🙂 Liking a book is very subjective. It’s amazing how so many people have so many different opinions about the same work! I will post a review when I have read it. I will be reading along with my cousin – probably in January.